The Downtown San Jose market for high-rise projects has been on fire lately and we are in the privileged position of being able to demand more from future projects. We no longer have to settle for whatever we can get as seen in the redesigns for Hampton Inn and One South. 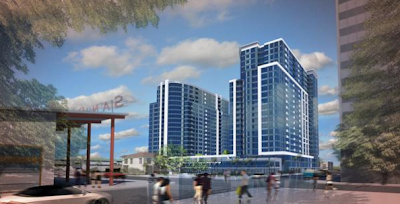 With KT Properties' two tower project across the street from the San Pedro Square Market, they hit the ground running with what I think is a pretty solid initial design. However, what if it could be better? If you look at the bottom two images, you can see an alternate concept that places the towers in an L shape instead of a "twin" configuration. I can see several benefits with the configuration. It would add a greater sense of volume and dynamics to the skyline from every direction. It would create a stronger retail pavilion adjacent to the SPSM with more potential for outdoor space since the tower would be further back instead of almost directly on top of the main retail area. It would also better highlight the historic Fallon House as a centerpiece for the area. What do you guys think about the L-shaped concept verses the twin tower design? Definitely the L shape is more interesting. Is KT Properties offering this as an alternative? 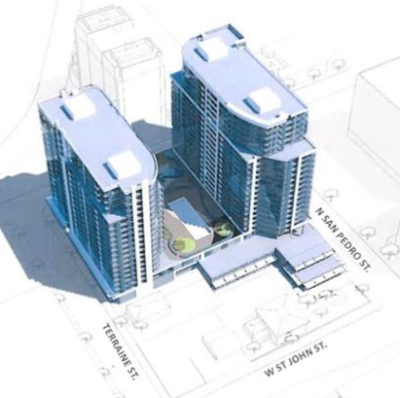 ... Also, does this design envision units right where the two buildings touch to form the center of the L? 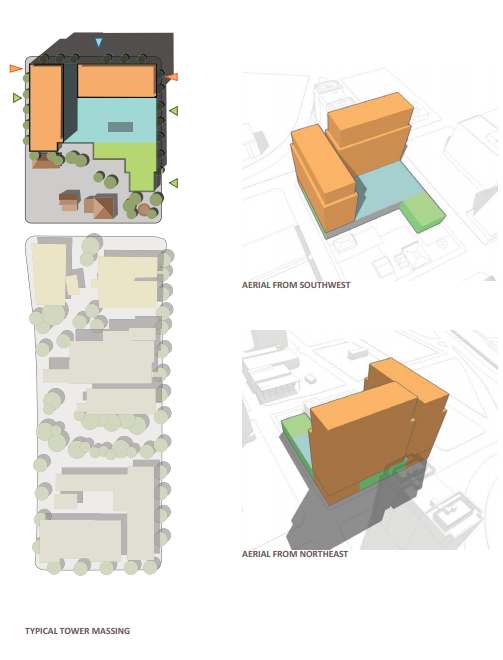 If so, don't you worry that the units of each building closest to each other will be much less desirable? Actually with the L configuration you'd have dramatically less units that face each other. 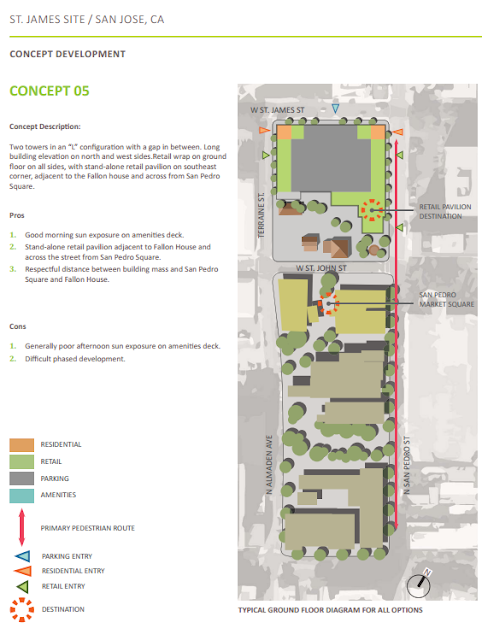 They talked about this at the community meeting, they go for this due to it creating a massive wall on St James that would assuredly pissed off City Heights owners. Different massing possibilities were brought up at the ARC meeting and they still came back to the current design. "None of these projects actually make advantage of the CA weather." Couldn't agree with you more. As a downtown resident, and owner/occupier, one of the main reasons I purchased an "old" place (built: 2001) was the fact that it had a big outside patio (with a view of downtown) as part of my townhome. These new condo towers only have tiny slit windows that open and worse, no outside space associated with the unit -- save a select few units in the building and those are only big enough for a tiny table and chair. What gives!!? 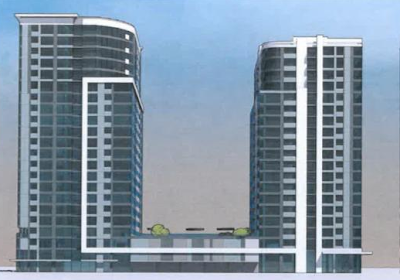 Guys, these are high-rise condos/apartment buidings, not low-rise townhomes or singlehomes with yards and lots. If you want those private lots, San Jose has a TON of those kind of homes. These high-rise are meant to increase density and get people to interact with one another via public spaces more. But if you want a bit of privacy in the building, you always have the outside terraces, usually by the pool and such. Both One South and Centerra buildings have a second terrace in addition to the pool terrace. The 88 building also has a second terrace as well besides the pool terrace. So there are semi-private places where you can go and enjoy the fine weather we have. Hawaii and San Diego has tall buildings that also have the same issue that you guys are describing. This is what comes with having high-rise buildings. That's the whole point. Maybe the high rise isn't the best option for Sillicon Valley. Oh, yes, we want high density. Welcome to smogged up, choked up state in 40 years. High density...SJ should NOT become another sprawling LA. These buildings are going to look like "c**p" in 25 years time and contribute NOTHING to the city legacy. Pack'em in, consume, leave behind. That's the mentality in urban planning nowadays. Agreed on all the high density comments & public space comments. 100% support density downtown! :-) My comment was around the specific lack of outdoor balcony or patio inclusion on the towers downtown. Run a quick Google image search for "high rise condo" -- see all those condos in other cities with all those units with a place to step outside? That's what we are missing. Again, except a few choice units. The88 has only 4 penthouse units with a balcony? City Heights has small balconies on a number of floor plans, 360 has only a few. Axis only on the pricey end units (I think) -- what do our builders have against balconies? 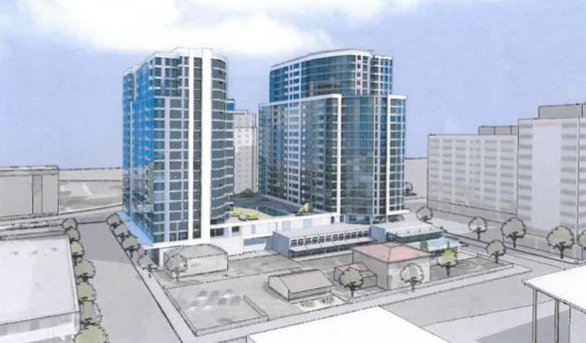 Go to Miami, or hell, even Chicago (um, I'm not on that balcony 2/3 of the year in rain, wind, cold) ... but San Jose just hasn't managed to embrace the high rise with balconies or outdoor space concept. Weird ... 300+ days of sun a year. I drove by the Axis earlier today and they do have balconies up and down the buildings, so it's not just the penthouse that has them. 360 has balconies up and down on the south end of the building. The 88 doesn't have balconies, but they do have a terrific terrace on the near-top that is very nice and large and affords one heck of a view. Centerra I believe will have quite a bit of balconies, in addition to the 8th story dog park/terrace and the 2nd story pool terrace. One South doesn't have any balconies but will have a 16th-story terrace facing the west and the 2nd story pool terrace facing south. I think as far as private outdoor space, we're alright on it. It's a bunch of high-rise after all, and those balconies are rather scary LOL (at least to me!). Have you guys seen the Domain apartments on North 1st? I saw that they have a terrace that wraps around the entire building on the very top floor, both on the outside of the building and on the interior of the building! That is an awesome design and I wish more low-rise/mid-rise condos/apartments would follow their lead! Yeah, most of the multilevel 2 and 3 bedroom units at the Domain have their own rooftop decks with private access. Pretty awesome layout. I think the tradeoff here is would you rather have outdoor space or more interior room? Finding the right balance can be a tough call for both developers and buyers. There are many high end buildings in SF that have very little, if any, outdoor space. The cost to make that area enclosed is marginal on a high-rise, and that interior square footage tends to be worth more per square foot than balcony space. As for the Domain, have to agree. I had no idea there was a terrace on top of the building until I looked at it from the top of the Hyatt House across the street. Very nice design and great utilization of the roof.